This project was awarded the 2012 Environmental Project of the year by the American Public Works Association, Washington State Chapter. 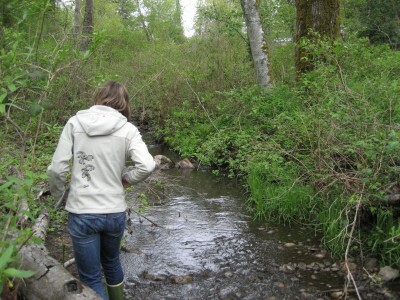 The Upper Silver Beach Creek Stabilization Project provides water quality and flooding relief to adjacent landowners in a suburban environment as well as reducing degradation to the natural downstream environment that outlets to Lake Whatcom. Vegetated swales, stabilized slopes, vaults and a raised and widened stream channel all contributed to the stabilization efforts. Improvements reduce channel incision, alleviate flooding, promote infiltration and filter phosphorous containing sediment. Mayfly provided preliminary design concepts and documentation and worked with a team to provide GSI expertise as the project developed. The design team included Land Development Engineering and Surveying and Osborn Consulting.